In early 1944 a plan was in preparation to concentrate evaders into areas that would be safely isolated from an Allied advance, and from the expected German withdrawal. By this stage of the war all escape lines were experiencing many problems with the movement of evaders from Belgium and Northern France to the Pyrenees due to Allied aircraft targeting communications, railways and river and road bridges. The provision of food was becoming a problem in the large towns and cities and safe-houses were being compromised. Evaders could not easily be moved along the lines and a number of ‘choke points’ had been identified by MI9 that had to be cleared. 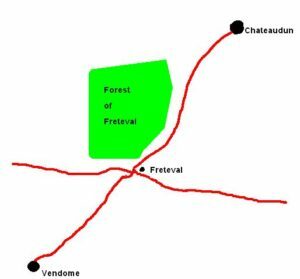 The camp near Chateaudun was based on the ‘Foret de Freteval’ and known as Operation Sherwood. For many years, due to the modesty of the Loir-et-Cher and the Eure-et-Loir Resistance groups, the Comete Escape Line and of course the evaders themselves, very little was known of this extraordinary story. 152 aircrew evaders from Great Britain, America, Canada, Belgium, New Zealand and Australia lived in perfectly organised camps in the forest between May and September 1944, in the heart of occupied France, under the very noses of German troops. It is quite remarkable how the Resistance groups involved managed to keep such a large number of evaders hidden and a secret from the inhabitants of local villages. Due to the excellent organisation of the camps, not a single evader was lost or captured. From Brussels to the Western Pyrenees, Comete was the main escape line for aircrew evaders, so it was to Comete that MI9 went for help and advice. A Belgian officer, airman Loucien Boussa serving with the RAF, was appointed as a main organiser. He had a difficult journey to the forest that included landing on the coast of Spain, crossing the Pyrenees, meeting up with Comete in the Basque country at St Jean de Luz, then heading north to Paris. Travelling with Boussa was radio operator Francois Toussaint. They reached Paris on the 13 May 1944. Boussa immediately contacted Comete and recruited Baron Jean de Blomaert into the plan. Blomaert was a remarkable man who, considering that the average ‘life-span’ of a helper on an escape line was approximately 90 days before capture, had worked with the Comete Line since 1940. He had many aliases and was known to the Germans as the ‘Fox’. On receiving an urgent message from London “invasion near, hide evaders on site”, Boussa ordered an immediate meeting with the leaders of Comete, the head of the FFI of Eure-et-Loir Maurice Clavell (Sinclair), Andre Gagon (later Mayor of Chartres) and two members of the Liberation Movement Pierre Poitevan (Bichat) and R Dufour (Duvivier). Bichat and Duvivier insisted that the Resistance Leader of the ‘Libe Nord’ for the region of Chateaudun, Omer Jubalt, should also be involved. Jubalt, a former gendarme, later to become head of all Resistance groups in the Freteval area, had ‘gone to ground’ with a Resistance colleague, Robert Hakspille (Raoul), having been warned of impending arrest by the Gestapo for Resistance activities. However, Jubalt and Hakspill who, who were still paid by the gendarmerie, started work immediately on their designated job of organising the countryside. Working from safe-houses and from the forest, they had the respect and support of the local people who ‘watched out’ for them. Water locations were found, arms dumps plotted, safe-houses arranged, couriers and organisers appointed. Farmers, millers, doctors, and bakers were all recruited from loyal Frenchmen. For security reasons the radio operator was moved ten miles away to the town of Moulineauf. Mme Jubalt ran a safe-house and the Jubalts’ young daughters, although still at school, became couriers for airmen. It is difficult to imagine what life in France was like in 1944. Everything was rationed to insufficient quantities. To obtain food, clothes and shoes was virtually impossible. In addition there was no fuel or petrol for cooking, heating or driving. The farm at Bellande, ran by the Fouchard family, was chosen as a food warehouse for the camp and as a slaughterhouse for animals. In early spring Jubalt and Boussa met M and Mme Fouchard and their daughters Micheline, Simone, & Jacqueline. They collected tarpaulins, sheeting and other materials and together with five aircrew from safe-houses, started to set up the camp. The first aircrew arrived. Evaders were usually collected from the station at Chateaudun and walked to the forest at night. Horse drawn carts and cycles were also used; evaders arriving by cart were given pitchforks to give the impression they were farm labourers. A guard post was situated about 1km from the camp to interrogate all evaders on arrival. Other evaders who had arrived earlier in the year were already in safe-houses awaiting a move to the forest. Earlier, in February, ten people from nearby Vendome had been arrested for hiding aircrew. They were roughly interrogated but gave nothing away and were later deported to a concentration camp. The organisation of the camp was amazing. Local farmers delivered live animals and local bakers, bread. Micheline Fouchard delivered food and animals daily using her horse and cart. On one occasion she was nearly killed when strafed by Allied aircraft. A roster for night fishing, guard duty, cooking and lookouts was arranged. A head cook was appointed. All tentage was covered in foliage, which had to be changed every few days. A parachute drop provided the camp organisers with French money, medical supplies and cigarettes. The Resistance patrolled the outer perimeter of the forest. The key to morale was information, so a bulletin board was placed in the centre of the camp. No one was allowed into the forest, with the exceptions of the doctor and the local barber, Albert Barillet from Cloyes, who paid a weekly visit. A field hospital was set up away from the main camp. The badly injured, mostly burns, were cared for in the homes of local people, who were mainly members of the Resistance. Mme Dupres of Villeboute, who was an English speaker, turned her home into a small hospital with the assistance of a lady companion and throughout the period of the camp until liberation, never had less than five injured airmen in her home. The couriers for airmen,between the camp and Mme Dupres’ home, were the schoolchildren Ginnette and Jean Jubault. While riding a bike about 100m in front of a horse and cart transporting evaders, Virginia d’Albert Lake was stopped by German soldiers at an impromptu roadblock. Betrayed by her American accent, Virginia was arrested and after harsh treatment sent to Ravensbruck where she nearly died. The evaders involved in the incident saw the soldiers and fled. Their guide, Daniel Cogneau, had to recover the cart and later search for his evaders. Virginia never betrayed the camp or the Resistance. In July, Maxine Plateau, a member of the Eure et Loire Resistance who supplied most of the food for the camp, was also arrested after a parachutage of arms was located on his land. He was severely tortured but revealed nothing. Security at the camp was increased. Mme Hallouin, who lived nearby, and was able to view approaches to the forest, kept a wood fire with leaves ready to light at her home as a warning of the approach of any Germans. The profuse smoke would alert the camp sentries and the camp could be vacated. 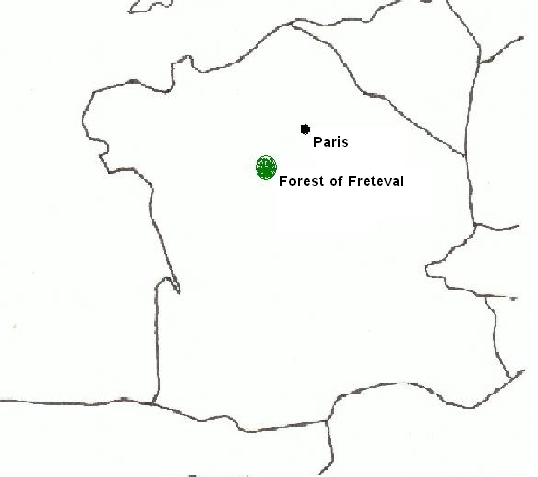 On the 12 August, a rescue force, organised by MI9 and led by Airey Neave, entered the forest. They had collected four buses, three jeeps, and two cars to transport the evaders back to Allied lines. The rescuers were supported by men from 2SAS on Operation Dunhill and 5SAS(Belgian) on Operation Shakespeare, who had been operating in the greater areas and headed for the forest. 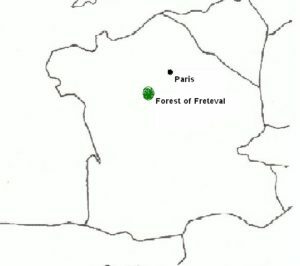 It is remarkable that MI9, together with Comete and local Resistance groups under the command of Omer Jubault, had managed to lead 152 Allied evaders, mainly at night, into the Freteval Forest, then hidden, protected, clothed, nursed and fed them within sight of German patrols from land and air. It is remarkable too, that the operation took place over a period of four months within 100m of a road used by many German vehicles. Today on the site of the western lookout is a memorial to the Freteval story. The memorial is a stone tail fin of a Lancaster Bomber dedicated to the 152 evaders and the bravery of the French people who hid them. The success of the operation indicates that none of the local people arrested by the Germans gave anything away under torture or harsh treatment in the concentration camps. Mesdames Lucienne (Callu) Proux and Marie-Louise (Delbert) Caspard, Messieurs Robert Germond, Rene Roussineau, Raymond Evrard and Maurice Pomier did not return from concentration camps. Madame Helen Germond , Virginia d’Albert Lake (Jacqueline), Messieurs Lucien Proux, Paul Taillard and Raymond Cordier all returned from concentration camps. Thanks must go to Cecile Jubault and Daniel Cognac who supplied much of the information of the Freteval Forest Camp, near Villeboute, on my visits to the area in May 92, and May 94. R Stanton.